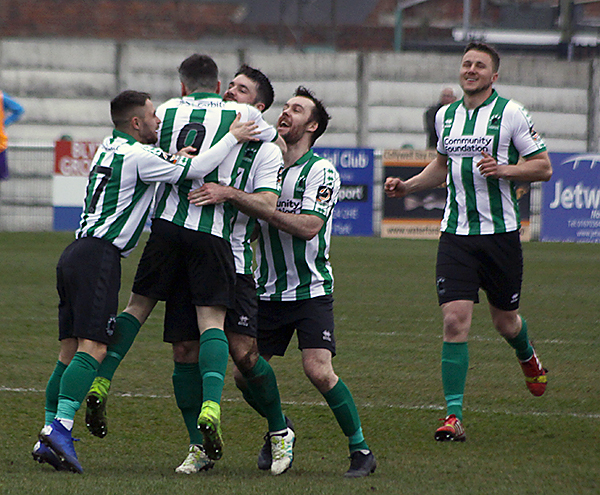 Blyth Spartans recorded back-to-back home victories for the first time in 2019 as four different players got on the score sheet. Sean Reid got the opener as his acrobatic effort found its way into an open goal after 10 minutes. Kieran Green then smashed home from the edge of the box right on half time to double Spartans’ lead. Adam Wrightson got the third of the game as his shot hit off the post before rolling into the net on 63 minutes. Taylor Allen got one back for Nuneaton Borough as he calmly finished through Peter Jameson’s legs as the game entered the final five minutes. Alex Nicholson got a goal after coming off the bench in the 90th minutes. Spartans started lively as they pushed for an early goal and they nearly got it when Dan Maguire cut inside from the left but could only fire safely into the keeper’s arms. Maguire stung Cam Belford’s hands as he smashed an effort straight at the keeper after only eight minutes. Blyth got the first goal of the match on 10 minutes after Maguire’s effort was blocked and found its way to Reid who improvised from a few yards with an overhead kick into an open goal. Maguire could have had a hat-trick after 15 minutes as his third effort of the night did not curl quite enough as it whizzed past Belford’s post. Spartans slowed the pace since they scored and a poor back pass left Louis Laing having to make a last-ditch slide tackle inside his own box to deny Nuneaton an equaliser. After a lacklustre spell from Spartans in the first half Wrightson jinked away from his man before curling one just wide of the post after 29 minutes. Maguire was played in over the top by Robbie Dale but he could not get the ball out his feet in time which allowed Luis Morrison to get back and put in a vital block on the half-hour mark. Blyth’s best chance of the half to double their lead fell to Dale as Michael Liddle put in a low cross for Dale who could not finish despite being a few yards out as it bobbled off his legs. Spartans doubled their lead right on half time as a corner was only partially cleared to Green who smashed the second goal into the bottom corner. It took 64 minutes for the first chance of the second half which resulted in the third goal for Spartans as Wrightson peeled off two defenders before calmly slotting past Belford off the post. Nuneaton had a chance to get one back as Josh Lundstram volleyed from a tight angle but could not direct it goal wards as it sailed over the bar. Maguire should have scored his first goal of the game as Wrightson floated one to the back post, but Maguire could not direct his header goal wards despite being unmarked. Dale also had a free header after Green whipped in a free kick but the captain could not get his header on goal and did not trouble Belford. Spartans could not keep back-to-back home clean sheets as Taylor Allen got between Laing and Lewis Horner and finished through Jameson’s legs. In the final minute of the 90, Maguire burst into the box past two players before squaring it to Nicholson who slotted home from the penalty spot.